On Saturday, August 14th, one of Sierra Leone’s most popular and funniest comedians of all time, Godfrey Manley-Spain alias “Lord Bongo” was laid to eternal rest at the Golden Gate funeral home where friends, relatives, community leaders and Sierra Leoneans of all stripes and color congregated to bid farewell and pay their last respect. Notwithstanding the circumstances surrounding the comedian’s untimely death and the immediate spitefulness and animosity it garnered, the huge turnout during the funeral service demonstrated the apparent readiness to move on in the Dallas Fort worth community. This signifies that the healing process will enable all to put on a cloak of forgiveness when they turn to a new page in the community’s chapter. Most people believe that, though the grief is not going to be an easy process to bear but they equally believe that Lord Bongo is departing for an eternal life, a life that is better than this world. A befitting tribute was paid by Donald Nat George (Dandogo), Bongo Johnson’s comedian nephew, for the sudden departure of his uncle. On behalf of the Professionals, he compassionately asked all to support the bereaved children and their guardian, Agnes During, during their difficult moments. He further claimed that the home going gathering for Bongo Johnson is a celebration of the significance attached to the two lives that lived with us. In his tribute, he also enumerated the history of the Professionals; a comedian group which he said was formed at a period Sierra Leone was economically and socially at its knee. He highlighted some of the significant roles played by the group in bringing laughter to the nation as a way to alleviate its plight and give hope to those who have lost all hopes especially during the dark days of the NPRC regime. The nation classified them to be celebrities at the time, a status and respect that he arguably enjoyed up to his death. “Dandogo” appealed to the community in the Dallas Fort-Worth area to come together again and bury all doubts and differences for the good of the children. He implored community leaders to set aside, as soon as possible, a day of prayers so that in his words, “there will never be any recurrence of this nature again”. 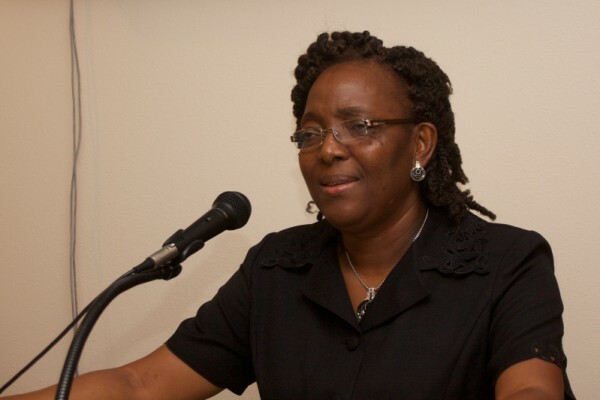 Nanette Thomas, President of the All People’s Congress in Dallas, whose purpose for humanity transcended all emotional judgment much to the admiration of many in the community spearheaded the effort in giving a befitting burial to “Lord Bongo“, at a time when some clearly pushed for an abandonment of the deceased by withholding financial contribution. Once again, Ms Thomas rose up as a true leader in the Dallas community to do what was morally right at the moment regardless of what others perceived. In her tribute, Nanette Thomas, who many people called “the iron lady”, made a direct but heart rendering tribute to the late comedy super star. “The circumstances surrounding the deaths of Godfrey and his spouse, Claudia, should be left with God to judge”, she added. 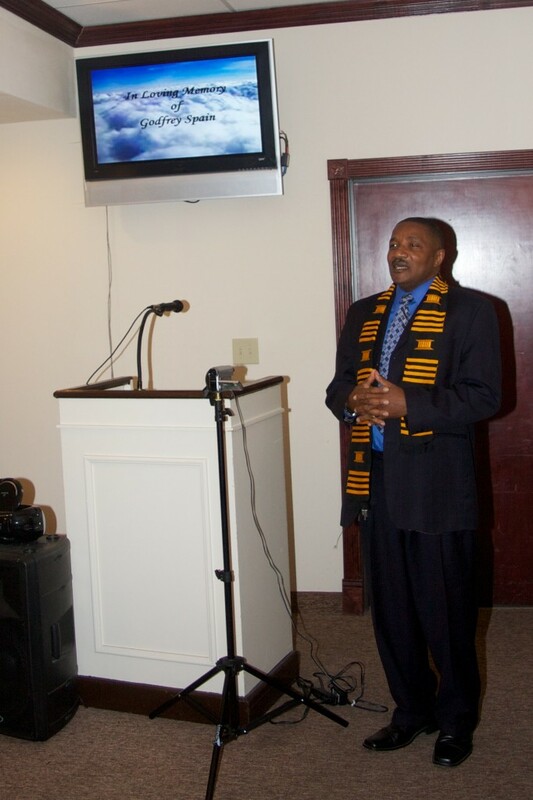 The APC Dallas chapter President, who was instrumental in ensuring that Lord Bongo is buried respectfully, rallied Sierra Leoneans all across the United States including the Sierra Leone Mission to the United Nations in New York and the Embassy in Washington to raise funds for the burial of late Godfrey Manley-Spain. She further noted that at the moment, Sierra Leoneans should explore with sensitivity and wisdom the complex situation faced by the bereaved children which according to her, “the severity of their problems is beyond dispute”. In his sermon, the officiating clergy, Pastor Solomon Kaiwu of the Ark of God International Church centered his sermon on “How to live well and die well”. He admonished the congregation that God does not want his people living long lives down here on this earth without doing the right things. He went on to say that there is a particular blessing that God can grant to us if we meet certain conditions under the covenant made with Jesus Christ. Pastor Kaiwu also stressed in his typical style that if we want to live well we must live for Jesus. He ascertained that, death is a necessary end, and that all forms of death is natural. “No one can disapprove what God has approved”, he concluded. May God bless the memory of Godfrey Manley-Spain, forgive him and may eternal light shine upon him as he dwells in peace in the glory and kingdom of our Lord Almighty. Bongo is buried now what?. What provision did he make for his kids?. None! I hope he ROT in HELL! He was dating two women but killed when the bread winner and wife of his kids asked him out of the house. He did not epitomized the characters he often and fondly played. These characters were resectful,prideful,contenful,hard-working,and would have never killed and commit suicide. I wonder what friends of the kids would think of them. I hope they have proper counselling for anger and frustration not to settle in them and may God not visit the sins of their disgraceful father upon them. How come pictures were not taken and showed of the congregants at the funeral parlor?. May Claudia soul rest in perfect peace. Even when she is not around she had made provision through SS for the kids. Sleep tight Sis! I totally agree with Garrett. I will go a stage further in saying that I hope he gets his day in the Court of our Lord. He committed murder and took the easy way out by killing himself. Now he has left two children at the mercy of the world. I hope and pray they become stronger in life and as successful as they can be. I am sure they did not show the congregation because the funeral was not well attended. And so it should be. How could one be sympathetic to such a situation. Godfrey was a friend of mine, we grew up in the same Waterloo Street area. I sympathize with his family for their loss. Special sympathies to the family of Claudia and May her Soul Rest in Peace. I hope bongo is in hell with all the other wife killers. Godfrey, sleep on sleep on, till we meet again, may God have marcy upon you. 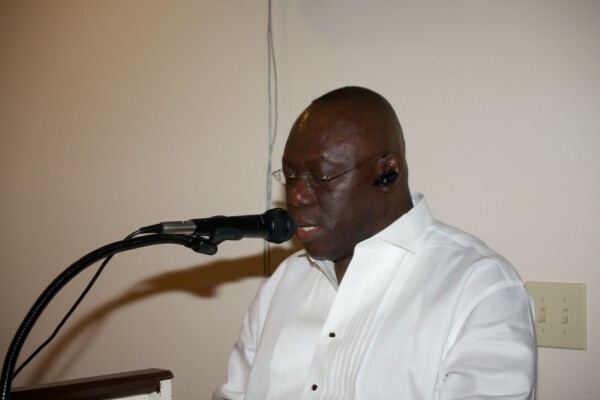 What is the SLPP cooking for 2012 ?